Angelica is originally from Queretaro, Mexico. She has lived in South Florida for the last 20 years. During this time her family has grown including her pet Pablo. She has groomed pets for the past 15 years. She enjoys cooking, and arts and crafts in her spare time. Alise was born and raised in Boca Raton Florida. She has been a groomer for over 5 years. Alise takes pride on each hair cut she does, she believes that each hair cut brings out a pets beauty and personality. Alise enjoys fast cars and Racing. 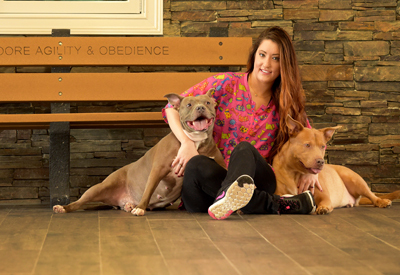 Tara’s life long long for animals motivated her to become a pet groomer. She received her certification from Pets Playground Grooming School in 2002. Tara keeps up with the art of grooming by attending seminars and trade shows. She takes her time to give each and every pet a positive grooming experience. 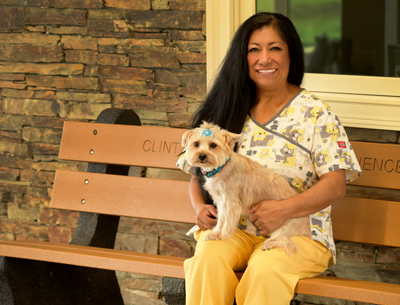 Tara has been part of the Clint Moore Animal Hospital Family for 3 years. Tara lives in Boca Raton, she has two boys, and is an avid cyclist.